If you haven't heard of IMF then you have not been standing within 500ft of me for the past year. IMF is the Interoperable Master Format and a standard from the SMPTE. If you're a numbers collector then you need to remember SMPTE ST 2067. Most likely you will want to know why IMF is needed and how to describe your requirements. This little vocabulary class should help. IMF builds upon technology from both the Digital Cinema community and the MXF TV community to create a format based on individual media components that is optimised for the automated construction of multi-version, multi-lingual, multi-platform assets. The core element of IMF is the Composition. This defines the timeline of a specific version of a title. Everything in IMF revolves around the Composition. If you want to play it on a monitor then you play the Composition. If you want to make a new version then you create a new Composition. The Composition is defined by the CPL (Composition Play List). This is basically an EDL that is written in a standardised way using XML. The CPL is constrained to cuts only editing but because it is optimised for multi-version distribution work and not compositing during the creative process. The CPL is metadata rich and includes content identification using House Numbers, EIDR and virtually any approach required. The video and audio for an IMF Composition is stored in Track Files. There is a clue in the name. Each file stores the media for a single track and so you will find the video essence in the video track file. You will find two audio channels in a stereo track file and 6 audio channels in a 5.1 surround file. The CPL also includes an XML version of the metadata found in the MXF Track File. 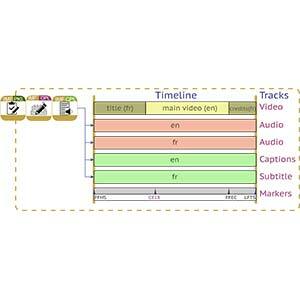 This includes descriptions of the video compression used, the number of audio channels, and most importantly the Multi-Channel audio labelling. IMF requires you to label which channel goes with which sound field group (L, R, LFE, Ls etc.) and also which language the track represents (en, en-US, fr-FR etc.). In Post Production, you are likely to receive an original Composition and some Track Files. You will be asked to make a new Composition with a different language. The process of transferring the files is called a Delivery. The Delivery will delivery you an Interoperable Master Package or IMP. This is a temporary structure for delivery and not intended to be a permanent object. Think of it like the Fed-Ex carton that the content arrives in. The carton has a packing list with an identifier that means you can always audit what was in the Delivery. The same is true for IMF. The Packing List or PKL has an ID and a list of all the assets that were delivered. It is really important to know that filenames are NOT used in IMF. All content is tracked via their IDs. When a Delivery is received, the package contains is a special file called the ASSETMAP which is an XML translation of Track File IDs to filenames at the point of interchange. After the delivery, you can rename the files, put them on S3 and use some other mechanism such as a MAM or tracking software to keep these IDs under control. Now you have the fundamentals of IMF, you might want to know more. There is a brand new SMPTE course created by myself and Pierre Lemieux (https://www.smpte.org/education/courses/imf) that will guide you through the whats, whys and hows of IMF. There are also a number of lectures given by those fine folks at Mesclado (http://www.mesclado.com/imf/). There are the standards to read (search ieeexplore.ieee.org for SMPTE ST 2067) or you can get in touch with me via the fine folks at KitPlus if you want something special. Figure shows a PKL with a single CPL having a video track where French inserts have replaced English originals. There are two stereo tracks in two languages, two caption / subtitle TTML files constrained to IMSC1 and a marker track annotating FFHS - First Frame of Head Slate, CE18 - a private marker indicating a compliance edit point, FFEC - first frame of end credits, LFTS - Last Frame of Tail Slate.